Da Capo Press, 9780306903120, 416pp. In early 1942, while the American military was still in disarray from the devastating attacks on Pearl Harbor and the Philippines, a single U.S. Army squadron advanced to the far side of the world to face America's new enemy. Based in Australia with inadequate supplies and no ground support, the squadron's pilots and combat crew endured tropical diseases while confronting numerically superior Japanese forces. Yet the outfit, dubbed the Kangaroo Squadron, proved remarkably resilient and successful, conducting long-range bombing raids, carrying out armed reconnaissance missions, and rescuing General MacArthur and his staff from the Philippines. Before now, the story of their courage and determination in the face of overwhelming odds has largely been untold. Using eyewitness accounts from diaries, letters, interviews, and memoirs, as well as Japanese sources, historian Bruce Gamble brings to vivid life this dramatic true account. But the Kangaroo Squadron's story doesn't end in World War II. One of the squadron's B-17 bombers, which crash-landed on its first mission, was recovered from New Guinea after almost seventy years in a jungle swamp. 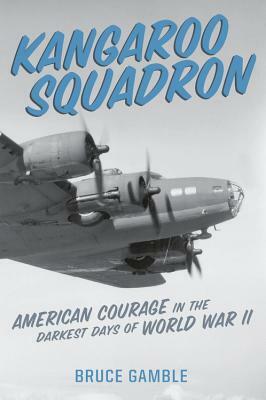 The intertwined stories of the Kangaroo Squadron and the "Swamp Ghost" are filled with thrilling accounts of aerial combat, an epic survival story, and the powerful mystique of an invaluable war relic. Bruce Gamble is an award-winning author and historian who served as a Naval Flight Officer during the closing years of the Cold War. Medically retired in 1989, he began working for the Naval Aviation Museum Foundation before turning to freelance writing. One of the most respected authors on the war in the Pacific, Gamble has written seven books and has appeared in documentaries produced by History Channel, Fox News, PBS, and the Pritzker Military Library. He lives near Madison, Georgia.